Robert Moses, the New York planner, builder, and bureaucratic entrepreneur who reshaped the nation’s largest city spent only a handful of days in Portland, but he helped to set Portland planning agenda for the quarter century from 1945 to 1970. Portland was a World War II boom city. After 1 percent growth in 1930s, Portland grew almost 20 percent in the next three years (1940-43). War industries in the four-county employed 140,000 people—that’s the rough equivalent of ten Intels (the metro area’s largest private employer in 2010). The boom of World War I had been followed by a severe nationwide depression, and everyone worried that the same thing was going to happen when World War II came to its close. Cities all over the country engaged in postwar planning to reduce the feared impacts. Here the initiative lay with the Portland Area Postwar Development Committee, an organization of business leaders and public officials. A key figure was Edgar Kaiser, who oversaw 100,000 workers in three huge Kaiser shipyards. He admired the park, parkway, and bridge projects that Robert Moses had directed in New York and decided that Portland needed his advice about infrastructure needs. The City of Portland, Multnomah County, Port of Portland, and School District together came up with $100,000. Moses arrived in Portland in September 1943 with a team of highway, bridge, and infrastructure engineers. They set up shop in the Multnomah Hotel (now the Embassy Suites on Southwest Pine). Moses cold-shouldered Mayor Earl Riley, telling him that he’d send for the mayor if he needed him. 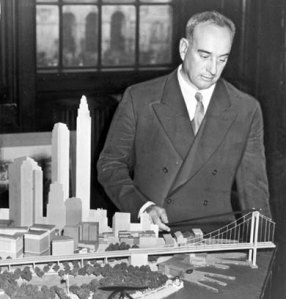 Robert Moses went back to New York after a week and left his team to draft a report on “Portland Improvement,” which he returned to present in November 9. “Portland Improvement” was an infrastructure plan and an early version of a public works stimulus package. As in New York, Moses did not force anything on an unwilling city. Rather, he gave the leadership of Portland exactly what it wanted—a blueprint for keeping the city economically competitive in the postwar world. It proposed a $60 million construction program to employ as many s 20,000 workers. It included $20 for a freeway loop around downtown, $20 for improvements to sewers, schools, public buildings, and airport, $12 million to upgrade existing parks and streets, and $8 million for highways outside the city. Newspapers and business leaders embraced the plan. So did public works commissioner William Bowes (who viewed himself as a local Moses disciple and equivalent). We might note that Portland, all by itself, had already pushed an expressway—Harbor Drive—through the downtown. We didn’t necessarily need lessons from Robert Moses, but he legitimized a public works agenda. -	An inner freeway loop around the downtown. -	A high bridge across the Willamette north of downtown (the Fremont Bridge opened in 1973) . . . although he hoped to expand the Ross Island Bridge for the southern part of the loop. I can’t emphasize enough that Robert Moses gave Portland’s leaders what they wanted in the 1940s, 1950s, and 1960s. The city was a happy accomplice, and it would be hard to imagine how we would function without the Sunset Highway/Vista Ridge Tunnels, the I-405/I-5 loop with its high bridges, without the schools, parks, and playgrounds developed during the postwar generation. At the same time, Moses and his Portland disciples like Bill Bowes had no patience with dissenters and they did some drastic things in the name of progress (the Morrison Bridge ramps, for example, which required clearance of several blocks of the historic downtown waterfront). Jane Jacobs was both a political and intellectual nemesis for Robert Moses from her initial community activism in New York in the 1950s, through her great polemic The Death and Life and Great American Cities in 1961, and in New York planning battles that followed. Portlanders began to emulate Jane Jacobs about a decade after her own forays into grassroots organizing and resistance, and most Portlanders today would say that we live in a Jacobean city, not a Mosaic metropolis. The equivalent of Jane Jacobs’s battle for Washington Square Park in the mid-1950s was the fight to remove Harbor Drive for what’s now Tom McCall Waterfront Park, begun by Waterfront for People with a picnic in the median strip in August 19, 1969. The equivalent of the battle against the Lower Manhattan Expressway was the successful fight to block construction of the Mount Hood Freeway through Southeast Portland along the Division Street corridor. The generation of young activists and politicians who took charge of Portland in the early 1970s had read Jane Jacobs (at least some of them had, as well as reading Herbert Gans and other critics of urban renewal). The city’s neighborhood association system—a product of the early 1970s—owes something, indirectly, to Jane Jacobs. When she visited Portland toward the end of her life, she mostly liked what she saw, for central Portland is—if not like lower Manhattan—awfully Canadian for a U.S. city. The irony is that much of what we like about Portland was facilitated by the Moses vision, especially as applied to parks and to the close-in freeway loop that has kept the central core central. A tip of the hat to Robert Moses may be too much, but he deserves at least a historical nod. Thanks, Carl. I came upon this post as I was composing a blurb that will be part of my chapter focusing on the period 1939-1948 in the Willamette River pollution abatement saga. As you mention above and also in Portland (pp. 137-140), Moses’ report recommended a $12M proposal for sewer interceptors and a primary treatment facility. My research has discovered that Abel Wolman and his team had first developed this proposal as part of their 1939 report to the City of Portland. The section in my book covering Moses’ involvement in the Portland sewer issue will be relatively concise, but it is highly important. City officials had been dragging their feet on adequately funding and preparing to build the sewer improvements since early 1939, and Moses’ report provided the leverage that advocates and a core group of city commissioners had long sought. This vignette provides a fascinating example of the ways in which external pressure and/or assistance can often be quite helpful in generating positive changes at the local level. Moses’ report spurred acceptance of Wolman’s recommendations, and Wolman’s recommendations were spurred by his leadership of the National Resources Planning Board’s (NRPB) Water Resources Committee; the NRPB had provided funding and guidance to the Oregon State Planning Board (OSPB) beginning in 1934, including assistance to a sub-committee of the OSPB that conducted research and generated recommendations that were essential in the formulation of the 1938 citizen’s initiative to create the Oregon State Sanitary Authority (OSSA). By 1943, Portland city leaders were ignoring pressure from the OSSA and others to build the sewage interceptor and treatment system. Thus, Edgar Kaiser called-in Robert Moses to get the ball rolling in this and many other areas where Portland city leaders were failing.